What says I Love You more than a sweet teddy bear and a heartfelt love poem! This Poetry Gift will surely touch the heart of someone you love. 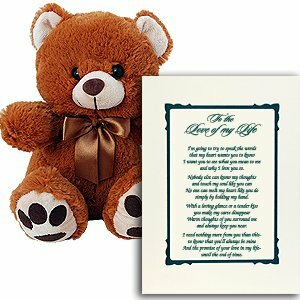 Adorable 8" plush teddy bear and framed "To the Love of my Life" poem (© Poetry Gifts - read poem below). The adoreable brown teddy bear is embellished with a brown bow. The love poem is displayed in an ivory-colored matte frame with a teal colored border. The matte frame has an easel back and can be prominently displayed on a table or dresser. Matte frame measures 8" x 10" and the poem area measures 5" x 7". Wonderful keepsake that will let the someone special in your life know how much you love them.